Mr. Crumbs is not much of a fan of method #1. He thinks that everything made in the slow cooker has a “slow cooker taste.” The jury is still out on whether that’s fact or his imagination, but in either case, I avoid cooking whole birds in the slow cooker just to be safe. We absolutely love method #2, but I’m not really the type of gal who grills. I’m sure I could if I really wanted to, but quite frankly, I don’t. First there’s the coal starter to mess with, then patience and time for the coals to get hot (neither of which I have) and when you’re done, you and your clothes and your hair all smell like grill… which means taking a shower AGAIN and doing my makeup and hair AGAIN and what momma has time for that when dinner needs to be done by 4:30pm so we can be at baseball practice by 4:45pm?! No thank you, I pass. I’m perfectly okay with letting Mr. Crumbs be in charge of the grill. Instead, I’ve got my own secret up my sleeve – the whole roasted, turned chicken in the oven. Yes, a long name I know, but well worth each and every syllable because this method makes the bird absolutely moist and absolutely delicious, every single time. But that doesn’t mean you shouldn’t make it. On the contrary! This is our family’s new “special dinner” and it’s my own nerdy way of thanking my family for graciously trying my new frugal tactics and continually eating my kitchen experiments. You see, there are only a few days each month when I have the time and energy to pull of roasting a whole bird. When they see a whole bird on the table, everyone knows that mommy had to pull some scheduling strings or sacrifice that second cup of coffee in order to have enough time to make dinner that night. Plus it’s not the most cost effective way to serve chicken. You’ll get way more bang for your buck if you cut up a bird into pieces first and then cook just what you need for the meal, or by cooking the whole thing and pick off the meat and portion out for meals. As a frugal foodie, this is hard for me to swallow, but it’s important that my family know that they are more important than the number of cups of meat I get out of a chicken. There is one tiny little loophole that I’ve learned to help prevent the possibility of half of my monthly allowance of chicken being devoured in one night: Serve only half of the chicken at dinner. Okay, so it might sound a little “shady” to roast the whole thing but only serve half, but you know what? It works! The family can literally eat as much of that half chicken as they want because the other half is sitting patiently in the kitchen, waiting for me to slice the breast meat for grilled sandwiches and pick off the dark meat for tacos. There’s no need to worry about whether or not there will be leftovers or about someone taking a second serving. Let them eat and enjoy and devour without thinking twice! Everyone gets the delicious, moist flavor of a whole roasted chicken. Mr. Crumbs gets his fix of big, whole pieces of meat. One bird can cover multiple meals (at least 3, but usually 5 since we rarely finish the whole half bird). With chicken already cooked and chopped/sliced and portioned aside, some prep work for future meals is done. Roasted chicken usually means roasted vegetables, which means more cooked food with less dishes to wash. If you’re feeding a family who is graciously going along with your frugal grocery budget efforts, you need to try this roasting method. Your family will greatly appreciate your “special dinner” efforts and you can enjoy serving your family these meals without blowing your budget. Remove innards from chicken and set aside for stock. Rinse and pat dry chicken. Rub and massage the entire chicken with salt. Sprinkle seasonings on top. In a 9x13 roasting pan, place the chicken on its side with one leg up. 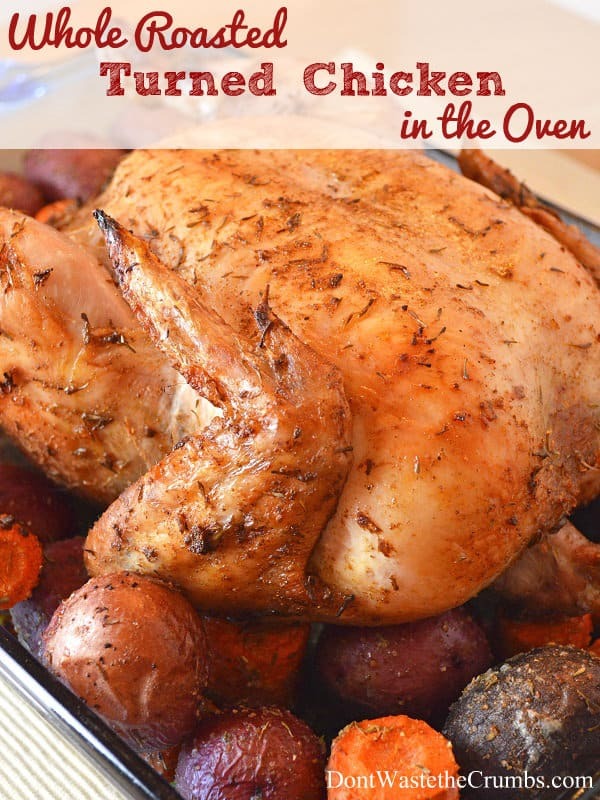 Surround the chicken with the roasting vegetables, if using, to help keep the chicken on its side. You can use crumpled up balls of aluminum foil if you are not using vegetables and need to prevent the chicken from falling over. Brush the skin with the melted butter and roast for 25 minutes. Using gloves or mitts, turn the chicken completely over so that it is on its other side with the other leg facing up. Again, use the roasting vegetables or the aluminum foil to prevent the chicken from falling over. Using gloves or mitts, turn the chicken breast side up and roast or 15-30 minutes more, or until the chicken registers 170F on an instant read thermometer. Remove to a platter and let stand for 10 to 15 minutes. Recipe adapted from Joy of Cooking. Do you serve special meals to show your family that they’re important, despite working within a grocery budget? I also think that a lot of things cooked in a slow cooker have a “crock-pot taste.” Especially meat. That was until my regular crock -pot broke and I surged on a ninja crock-pot. It’s amazing and no more crock-pot taste. Definitely worth the investment. Aha – thanks for the tip Kelly! I didn’t ours had that taste, but his memory is from having many crockpot meals in his childhood. I’ll have to experiment a bit more with our own machine. I know our bread doesn’t taste like crockpot because he eats it, lol!! May I ask what the difference is when you cook the bird on its side? I’ve never heard of that before. It allows each side of the dark meat to get browned while allowing the natural juices to flow downward into the breast meat. It helps to keep the breast meat moist, which is a big problem with oven roasted birds. Wow… stretching 1 bird to 3-5 meals is AMAZING! and here I am with 2 birds in the oven right now hoping I’ll be able to stretch it to 2 meals! We have 6 kids and the 11 yr old and 9 yr old boys (the oldest 2) eat as much as my hubby who’s an arborist and does hard physical labor outside in the freezing weather all day! I can’t wait to read what more you’ve got to say on stretching food out! Also, your chicken sounds great! Hey Emily! I’ve been there and done that. Actually, we had another child 7 yrs after our 6, so we had 9 eating- and the 5 yr old boy decided he needed to eat as much as the 17 yr old football player! Now I’m down to three kids. A few months ago I felt I had finally arrived :-), While dad was out of town,I brought home a Costco rotissorie chicken. We had it for dinner with lots of veggies and grains. I put a little of 1/2 of it into bags for something later, and I made the remains into cashew chicken wraps(see recipe on this sight), using extra cashews because they’re getting old. Then I made bone broth! 5 meals! Actually, it ended up I combined the 2 bags and made chicken salad later in the month. But the truth is, you’re feeding lots of mouths, and some of them are really hungry. Food (any kind!) is expensive when you’re feeding in bulk. If you don’t already, buy everything you can in bulk, especially meats, bean, and grains. See if there is a local food co-op you can join. Look for stores selling reduced bread (either free standing or dollar tree). I planned my menus so that we had a soup night, beef night, chicken night, cheese (and/ or noodle)night, bean night , and leftovers night. We used to do a pizza night, but I discovered I was buying delivery pizza too often. English muffin pizzas might be a cheap option, though, if you have a discount bread store. In the summer we had “Farmer’s dinner”- whatever veggies I found really cheap, or grew when we gardened, usually with cheese sauce to throw on our potatoes. The bottom line is that for years my grocery budget was much higher than my house payment. But that’s okay. Keep looking for cheap, healthy sides to serve along those whole chickens, and you may find yourself getting 5 meals (out of 2 birds of course!). P.S. I always cook my bird breast side down so they side w/ most meat (and driest meat), is nice and juicy! Thanks for sharing … Can’t wait to give it a try for tomorrow’s dinner! I think I’ll add a honey lemon glaze to the last turn. Thanks Liz! I’m sure it will come out delicious!! This is my hubby’s favorite meal, though I’ve never cooked it on it’s side. He’s weird about cooked carrots (loves them raw, but cooked? Heaven forbid) but will tolerate them when they’re cooked in the chicken juices. He would also never eat chicken noodles soup until I made stock out of the bones and extra bits of the roasted chicken and threw in some shredded leftover dark meat and the carrots. We can usually stretch this out for at least five meals (there are only two of us, though we do eat more than we should). A good idea for the leftover chicken is to make sandwiches with a good creamy cheese (like provolone), shredded chicken, and homemade pesto. I make pesto using Isa Chandra Moskowitz’s Appetite for Reduction cookbook, which uses beans instead of most of the oil. Even if you aren’t vegan, I can absolutely recommend that cookbook for people that are trying to convince their spouse that not only hippies are vegetarians. I agree with using leftover chicken for sandwiches! We like our grilled, and often make the same combination you mentioned, but add tomato as well. It comes out like caprese salad with chicken… and in between two slices of butter homemade bread?! Oh my goodness. Amazing! Just out of curiosity, how big is your typical whole chicken? Sorry if this seems like a silly question… When do the seasonings get added? I see that the 1 T salt is supposed to be rubbed over the bird before putting it in the pan. Do the other seasonings get sprinkled on after the melted butter? I found you through The Nourishing Home and I’m so glad! This chicken was delicious! I’ll make this again for sure! I’m so glad you liked it! Kelly is so wonderful – she’s been a blessing to me in both blogland and the real world. Welcome to Crumbs Susanna – I’m happy to have you!! It’s not all in Mr. Crumbs’ head!! I have thought for a long time that slow cooker meals have a “slow cooker” taste, too! LOL, I know he’ll feel happy knowing he’s not alone! Made this for dinner tonight and it was great! The whole chicken was moist and the skin tasted amazing! So glad you enjoyed it Hannah! I absolutely LOVE this cooking method! Last summer, I had my 3 teenagers take turns cooking one meal each week. I opened up my Pinterest page with several recipes of different main courses I had picked out already. My 15 yr old son said he wanted to serve rotisserie chicken and the only rotisserie cooking capability we had was a built in feature of our toaster oven, but it wouldn’t even hold a 6 lb chicken. So I picked this recipe out for him and it turned out better than any chicken I had ever cooked. Everybody liked it so much he cooked it twice! And since school has started, I have used this recipe almost every week! I’m a full time homemaker and I’m not homeschooling anymore so I have plenty of time on my hands to get stuff done while they’re at school and then I have at least 2 hours to devote completely to dinner while they do their homework. My kids are such picky eaters and my husband and I are on a fairly strict diet of protein and fruit and veggies with tiny portions of rice, but no other grains, so this recipe is PERFECT. And it’s so good, my husband even eats some potatoes soaked in the juices of the chicken and just plans ahead of time to have no carbs that day so he can have everything in the turned chicken rotisserie meal. Plus, he even bought me this really cool roasting pan with a removable metal rack that cradles the chicken and its large enough for 2 medium chickens or 1 very large turkey and there’s plenty of room under the rack for the potatoes and veggies. (It’s a 13.5″ X 18″ X 3.5″ pan with large handles from Costco.) Thank you so much for revolutionizing our kitchen! So far, this is the only recipe that nobody complains about. It was always spaghetti until my 17 yr old, then 14, decided he doesn’t like anything made with tomatoes and my husband and I could only have a small portion of rice pasta. I never thought I could find a recipe that would replace spaghetti night! My dad has a pan similar to what you mention and he loves it too – so glad you guys enjoy this recipe so much! I love hearing the feedback when families enjoy my recipes! And to officially replace spaghetti night, now THAT’S a compliment! Anyway…. it’s nice to know that there’re some good communities on the Internet, though the jury is still out on Facebook, I’ve only used it 3 times since I got on it a couple months ago, and all I did was take over my daughters old account so it already had our relatives and church friends on it. So I didn’t have to set up anything, just looked at everybody else’s posts and “liked” and reposted. I don’t know where they find all those little pics with wise sayings on them! ( I forgot what my daughter calls those… ) And they post sooooooooo many every day. It took me two hours just to look at 2 days worth of posts! Yes, I read every single one of them! Thank you for taking the time to leave a comment Becky, and it warms my heart to hear that you think Crumbs is a positive community – that’s one of the reasons we continue to write every week! Silly question, but do I leave the chicken uncovered in the oven or cover it with foil?